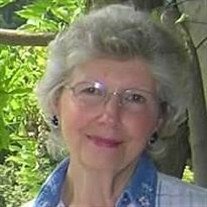 Donna Rae (Douglas) Horstmeyer, 82, of Hannibal, MO went to be with her LORD, at 11:15 p.m. Wednesday, September 5, 2018, at Hannibal Regional Hospital. Celebration of Life Visitation will be held 5:00 to 7:00 p.m. Saturday, September 8, 2018, at Calvary Baptist Church in Hannibal. Funeral services will be held 3:00 p.m. Sunday, September 9, 2018, at Calvary Baptist Church. Chaplain Clay Thomas and Pastor Jeff Anderson will officiate. Music provided by family, her grandson Justin Horstmeyer and Helen Linnenburger. Private family burial will be at Grandview. Donna was born on December 7, 1935, in Hannibal, MO the daughter of John William Douglas and Zella Marie Lawson. She was united in marriage to William T. "Bill" Horstmeyer on June 20, 1954. He preceded her in death on April 29, 2012. Donna is survived by four children, Shelley Marie Sanneman and husband Keith of Burbank, CA, Mark Douglas "Doug" Horstmeyer and wife AnnieLou of Sanford, FL, Karla Rae Thomas and husband James "Clay" of Fayetteville, NC, and Teresa Lee Horstmeyer of Hannibal, MO; nine grandchildren, Jason Sanneman, Sean Sanneman, Derek Horstmeyer, Justin Horstmeyer, Luke Horstmeyer, Krista Bowen, William Benjamin Thomas, Brandon Horstmeyer and Kendal Horstmeyer; fourteen great grandchildren, Riley, Kayla, Nickolas, Taylor, Baker, Summer, Evelyn, Corinne, Henry, Mary, Teddy, Constance, Brandon, Jr., and William. In addition to her parents and husband, Mrs. Horstmeyer was preceded in death by much loved grandson, Daniel Douglas Horstmeyer. Donna graduated from Hannibal High School in 1953. She married the love of her life "Bill" in 1954 and they shared fifty-seven cherished years together. Donna's greatest loves in life included her Savior and Lord, Jesus, her lifetime companions Bill and her family. In her devotion to both God and Bill she served alongside him, "Brother Bill" as he pastored Midway Baptist Church in Georgia for 27 years. She particularly loved teaching children. Donna was an instrumental supporter, both in prayer and deed, to Bro. Bill's numerous evangelical mission trips to the Philippines and countries on 5 different continents. Mrs. Horstmeyer was a faithful member of Calvary Baptist Church. Memorial contributions may be made to the Christian Light Ministries, in care of the Smith Funeral Home and Chapel who are serving the family in these matters.